Oven cleaning… It’s not a job I particularly enjoy (I can’t remember the last time I did actually clean my oven) and I’ve never heard anyone I know speak with any fondness of this task…until now. Jeff Skilton of Southern Oven Services (SOS) takes much delight in his work and when he talks about the art of oven cleaning he does so with a passion. Jeff spent over 17 years as a milkman so is fully experienced in dealing with his customers direct. 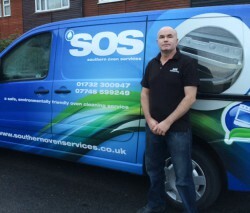 When Jeff and his partner Fiona moved to Edenbridge 5 years ago they realised there was room in the local market for an oven cleaning company and launched SOS nine months ago. Oven cleaning is not about scrubbing the oven with the latest brand of oven cleaning foam which can be quite potent. Jeff spent two months with a professional cleaner, attending jobs with him and really learning the trade inside and out. He was also keen to make sure he used all the latest in environmentally friendly products so there would be no chemical smells in your house after he’s finished his cleaning work. After each clean, Jeff runs a dry steamer over the oven so it doesn’t just sparkle but is germ free too and you can start using your oven straight away. 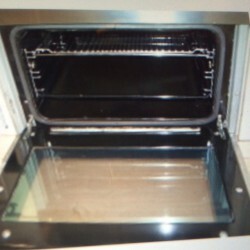 In order for an oven to be cleaned properly, it is taken apart as much as possible and all the removable elements (glass, racks, trays etc.) are soaked in a special heated dip tank which is in the back of the van. This process removes grease carbon and burnt on food. To ensure no mess is made while he’s working in your property, Jeff comes complete with shoe and carpet covers to every job. So what are the benefits of cleaning your oven regularly? Well, performance can be dramatically improved (depending on how much grime has been allowed to build up), food tastes better coming from a clean oven, and of course it reduces the risk of your oven becoming a fire hazard. 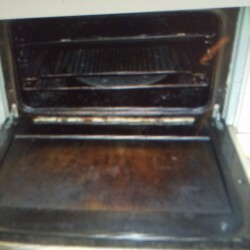 You can see from the pictures exactly what a difference SOS can make to a dirty oven, bringing it up like new. It’s not just the inside that is cleaned but the hobs and oven casing too. 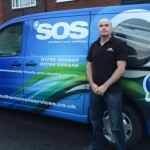 SOS have both domestic and commercial customers and can carry out contract work as well as one-off cleans. They are fully trained, equipped, certified and professional with their service delivery.